This article is from Rabble.org.uk and refers to a raid carried out yesterday (21st June) in Walworth. Sunday 15 May, 6 -11 PM @ The Field, New Cross. 385 Queens Road SE14 5HD. The war against the borders is not just at the frontiers of Brenner, Idomeni or Calais, but also in our own neighbourhoods. 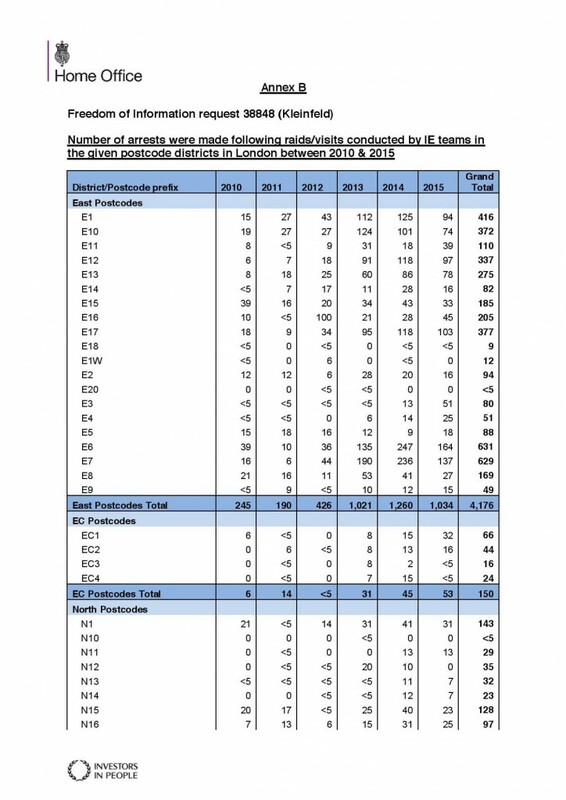 Home Office “Immigration Enforcement Teams” attack our homes, shops and streets every day (an average of 33 ‘visits’ per day across London), often working hand in hand with police, local authorities and property developers as part of the Social Cleansing of London. But their attacks are not going unopposed. 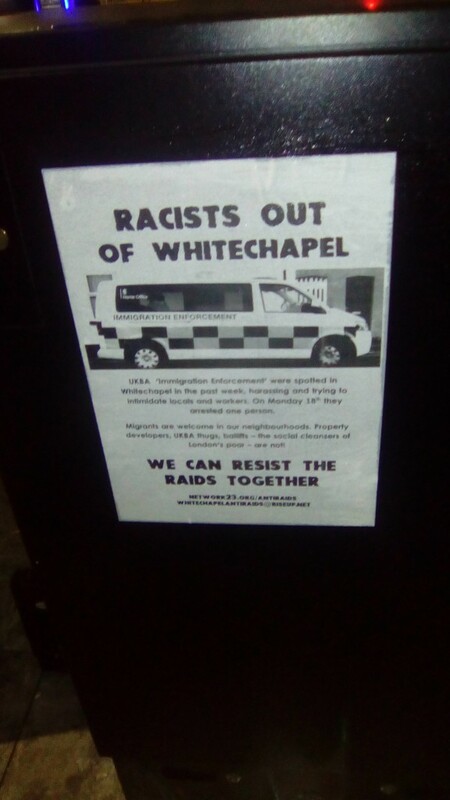 In East Street (Elephant & Castle), Peckham, Shadwell, and many more areas, people have stopped arrests, chased away Home Office bullies, blocked and sabotaged the “racist vans”. 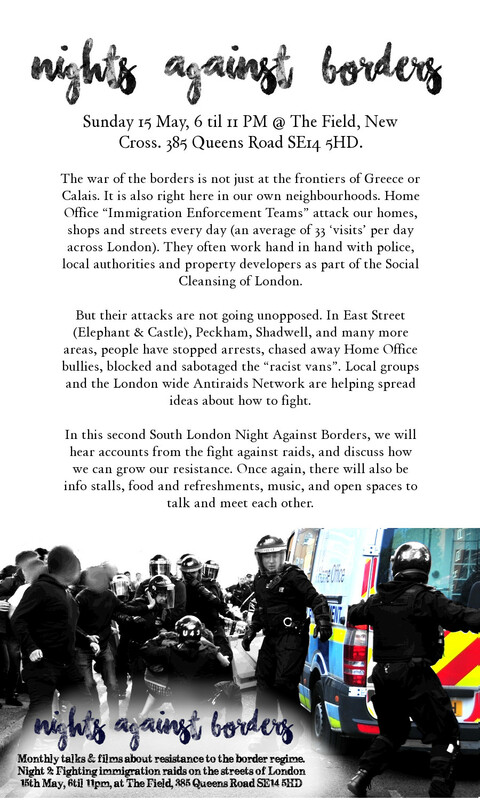 Local groups and the London-wide Anti Raids Network are helping spread ideas about how to fight. 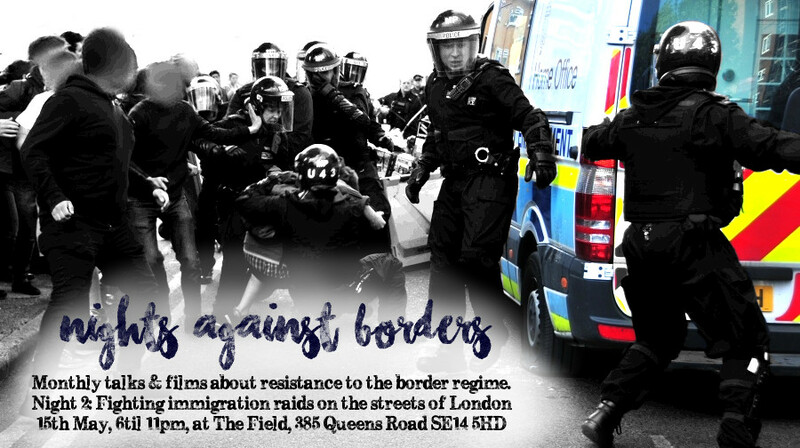 In this second South London Night Against Borders, we will hear accounts from the fight against raids, and discuss how we can grow our resistance. Once again, there will also be (vegan) food and refreshments, music, and spaces to talk and meet each other. Download & print the poster below. On Saturday 4th January 2014, whilst walking along Oxford Street, central London at around 1am, two people spotted a UKBA van parked in front of hoardings for building work. Both witnesses went to see what was happening. On the pavement behind the vans, there appeared to be 3 people sleeping in a shop front. Gathered around them were various ‘official looking’ people. Several uniformed UKBA officers were clearly identifiable, plus several uniformed police, and other ‘officials’ in plain clothes with various utility belts and body armour protruding through their clothing. 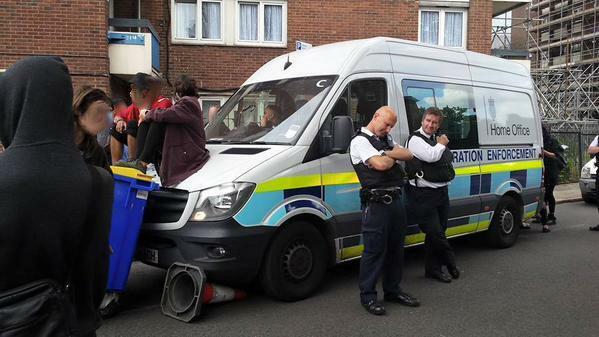 A UKBA officer was looming over one of the people sitting on the floor. The witnesses approached this person, and informed him that he did not have to speak to the border agent, answer any questions or show her any identification. The border agent insisted this was not true, and that the witnesses should go away. One of the people getting questioned began to get very agitated as he was wondering why there was so much attention. Witnesses explained that they were solely there to observe the UKBA and the police. The officers asked the witnesses ‘what are you doing here’ to which the male witness replied ‘we were just walking along the street’. The officer then said ‘why don’t you carry on walking then’? 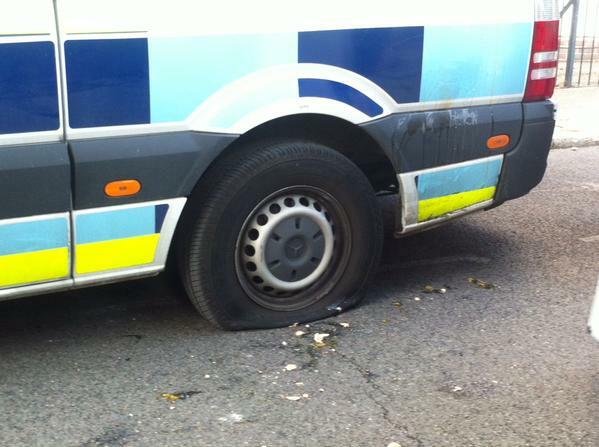 The witness replied ‘well, I’m standing here at the moment’ and then asked the officer ‘what are you doing here’. This seemed to provoke a fit of rage from the officer. The officer – PC CW 3206 from Central Westminster – exclaimed ‘I’ve had enough of you people’ and grabbed the neck of the male witness, violently forcing him back against a wooden pillar that was supporting the building site hoarding. The witness did nothing to retaliate, believing the officer was just trying to briefly scare him, or maybe arrest him. However the officer then proceeded to crush the throat of the witness and making it harder to breathe. The officer threw the witness to the ground, violently twisting his arms. The witness shouted to passers by to film what was happening. The officer then asserted more force, twisting the handcuffs causing severe and ongoing pain to the witness. As the force on his upper body increased, the wind pipe of the witness began to close up, and he struggled to breathe – this is recognised as a dangerous position of ‘restraint’ by the Metropolitan Police themselves, causing what they describe as ‘positional asphyxiation’. The witness tried to tell the officer he was an asthmatic and couldn’t breathe, but got no response. The torture or ‘pain compliance’ that the officer was carrying out continued for at least a minute or more. Eventually, the officer then dragged the witness up using the handcuffs, further cutting into the witness wrists, whilst still twisting them, and slammed him against another pillar. The witness was arrested, held for 4 hours in the police station and later bailed for a public order offence of ‘using threatening words / behaviour to cause harassment, alarm or distress’. The UKBA inspectors managed to get the bankcard of one of the people being checked. They asked him to stand up to be photographed against a pillar, and then two officers went into the van. One of them came back about 20 or 30 minutes later, and served some documents to the man and explained to him in English that he had to present himself on three occasions to the UKBA and then would be deported to Poland sometime in February because he failed to show willingness to remain in the UK, because he had failed to sign on at the Job Centre on a number of occasions. The man had been in the UK for 9 years and was extremely shocked, so was his friend who was awake. People living and sleeping around Oxford Street and Marble Arch told the Anti Raids Network that they are harassed by Police and UKBA on a daily basis. Some people report being repeatedly arrested and having documents/money taken away from them at the police station. Last week on Brick Lane we saw, once again, that sometimes all it takes to see off an immigration raid is a handful of people raising their voices. 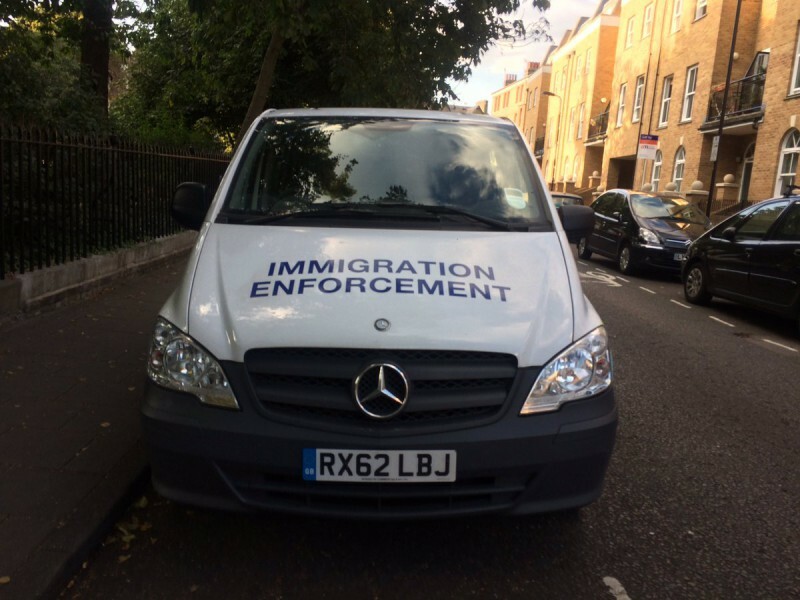 Monday 26 July, early afternoon, a blue-and-yellow-striped Immigration Enforcement “racist van” is spotted parked up on Old Montague Street, off the Whitechapel end of Brick Lane. Two uniformed Home Office officers are sitting in the front. An alert goes round, a few people arrive on the scene and go looking for any signs of a raid in the shops nearby. A number of other UKBA bullies are seen, not in uniform but wearing stab-proof vests, in an unmarked grey van (VW transporter license number MX13AWZ) a little further up Brick Lane outside the police shopfront. A couple of people go to challenge them, asking: “what do you think you’re doing?” “where are you raiding?” “do you have a warrant?” And just telling them plainly that racist bullies aren’t welcome in Brick Lane, that they should leave. Speaking calmly, but in loud clear voices so that other passers-by start to notice and gather round. The wannabe cops react with typical sneering arrogance, but also look definitely flustered. A few more people start gathering round, people come out of the shops to look. After five minutes or so of this, the officers get back in their van, shut the doors and do up the windows. A couple more minutes later, and the marked van has pulled up behind them. Then the two vans pull out and start driving in convoy slowly north up Brick Lane. A few people follow them, shouting. Someone in a car now stuck behind them starts honking the horn and shouting at them too, then is joined by a motorbike rider who does the same. After a little bit of this strange procession, they speed up and drive off. They weren’t seen again around Brick Lane that afternoon. So what were they up to? We can’t know for sure, but it seems likely they were about to raid a restaurant or shop. The plainclothes officers would have gone in first. The more obvious marked van kept on a side street round the corner so as not to attract attention, and would have been used to cage the people they arrested. We can guess this because we’ve seen the same pattern time and again. A routine operation, an everyday occurrence, “just doing their job”. 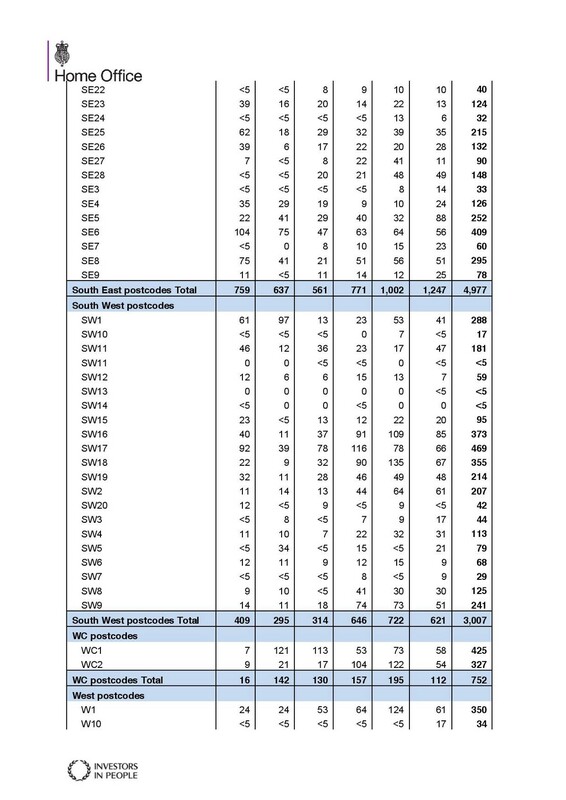 There were 4,573 raids last year in London, with East and South East London areas hit particularly hard. Over 12 raids every day. Every day, people’s lives and dreams ruined, people thrown into detention centre hellholes, families and relationships broken up, people deported to poverty, torture or death, more human meat ground up in the mincing machine of the border regime, that starts with a bunch of cocky macho bullies in a van. But we’ve also seen, many times now, that it only takes a few of us standing up to them to throw a spanner in the machine. On Monday, less than half a dozen people confronted this bunch, calmly but firmly made their presence known, and alerted others in the street. That was enough. This is certainly not a one-off. In Deptford last month, again, it was only a handful of people who challenged a raid in progress, and Immigration Enforcement turned tail and left, even abandoning their marked vehicle. We’ve heard many other stories that haven’t been so widely reported. Such as one night raid in Kentish Town a few months ago when, again, a group of 5 or so people confronted a UKBA team about to kick down someone’s front door, and scared them off just by standing there with their faces covered. For sure, it won’t be so easy every single time. But often it is. Why? We might speculate that Home Office teams have standing orders to avoid any attention or “disorder” (until someone leaks internal documents on this, we can’t know exactly what). We can remember that these officers have far less powers, less training, and less pay than police, and don’t even get a truncheon. One thing we do know is that actually most raids are of dubious legality, and so they may well be wary of getting challenged when they are themselves breaking the law. Apart from all that, what they are scared of is that a handful of people challenging them will turn into a crowd which has the power to actively block their raid. We saw that, for example, in Peckham last year, when dozens of people united in the street and chased the vans away. Or in East Street on 21 June last year, when well over 100 people came out to see them off. And we remember that, after that day on East Street, which had been a regular target for Home Office raids, they didn’t come again for at least a year. For sure, one day they will come back, or just hit somewhere else. But every time one operation is aborted, that means maybe someone isn’t in detention or on a deportation flight. That in itself is a big thing. And more than that, every time a raid is stopped like this, every time people stand up and say “No”, we put them on the back foot, meaning they will be a little less confident next time. And, maybe most of all, we encourage ourselves and each other, we see and we show that it is possible to fight back. And to fight back you don’t need to be some kind of heroic “activist”, or have any special skills or knowledge. You just need a few friends or neighbours, and yes a little bit of confidence. 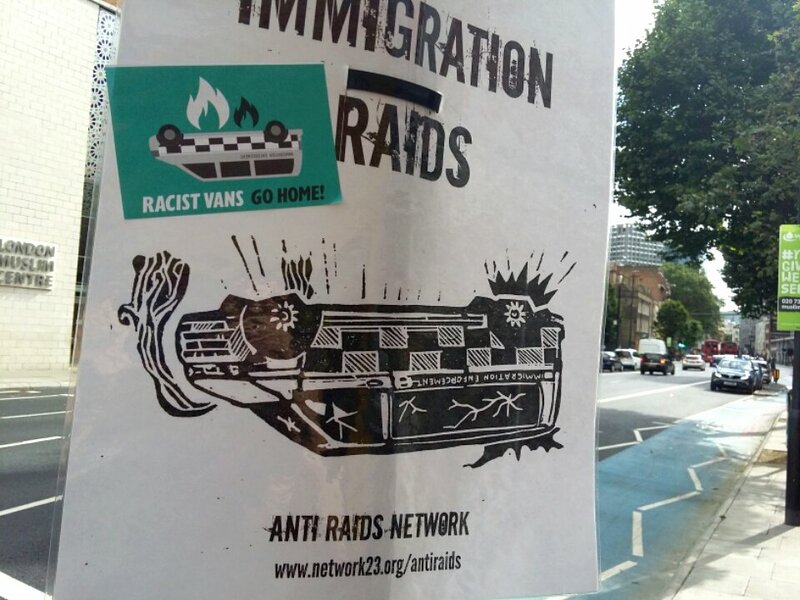 As people involved with the Anti Raids Network have often said, we are not “the group” or “the organisation” fighting raids in London. The aim of our network is just to share a few communication tools, a few information resources, and a few stories like this to show what is possible. By doing that, maybe we can help grow support networks in our neighbourhoods and help boost each other’s confidence. Then it’s down to all of us to take action in our streets, whoever and wherever we are. 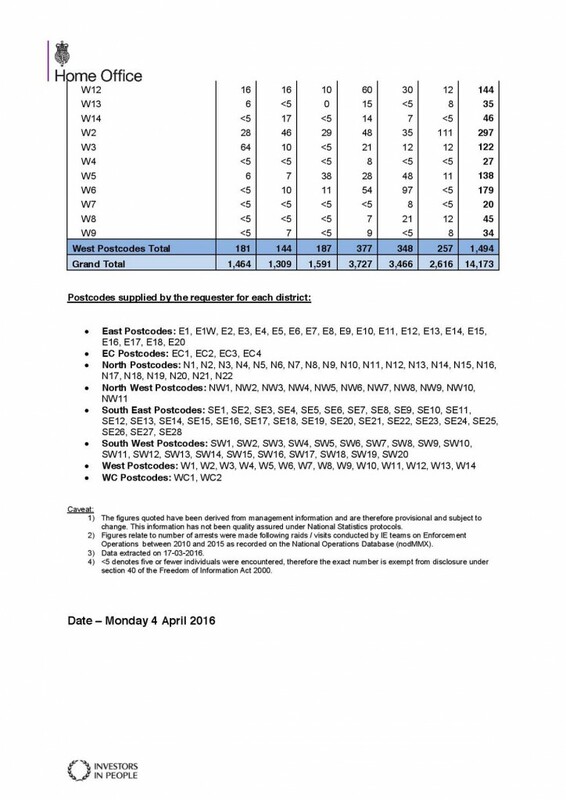 Up until now, it has been difficult to get a precise picture of the frequency of immigration raids across London. 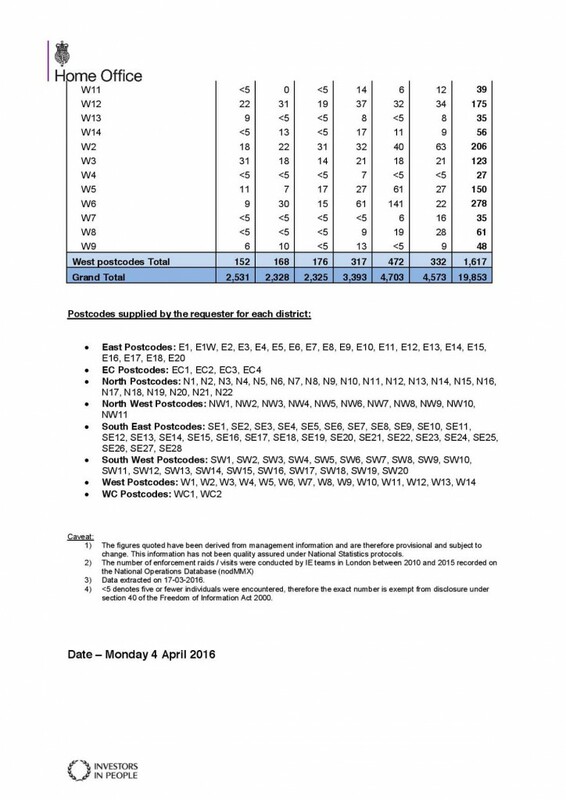 A previous FOI request found that an average of 33 enforcement ‘visits’ took place across London each week, but visits could also mean intelligence gathering trips as well as raids. 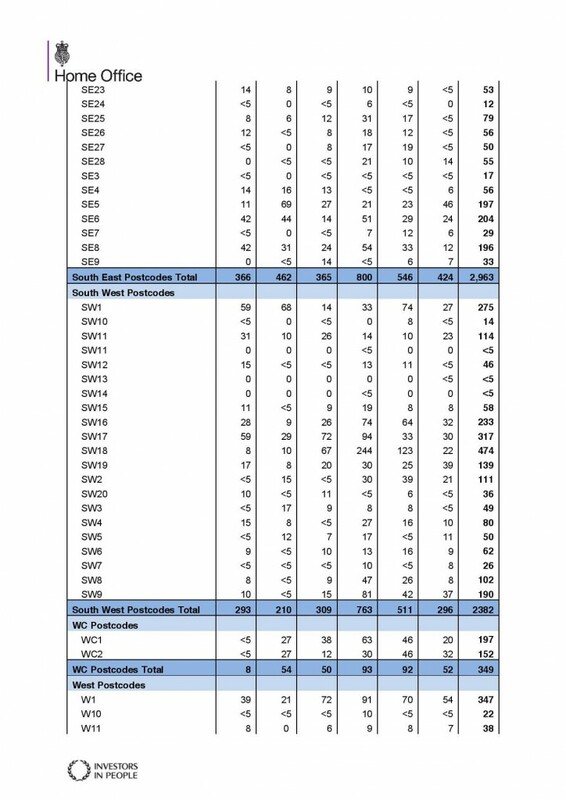 There were 19,853 raids — almost 11 a day — from 2010 to 2015. The number of raids has increased by 80% over the past five years. 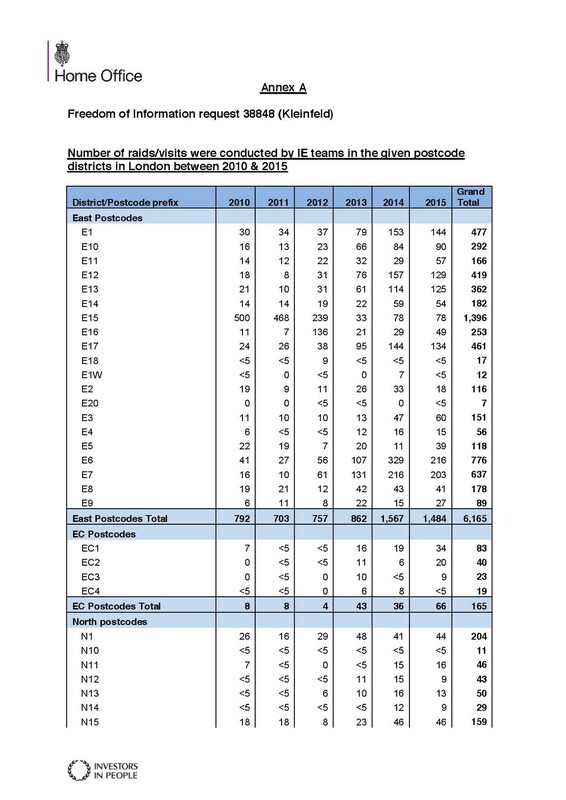 Immigration raids in London peaked in 2014 with 4,703 raids, up from 2,531 in 2010. 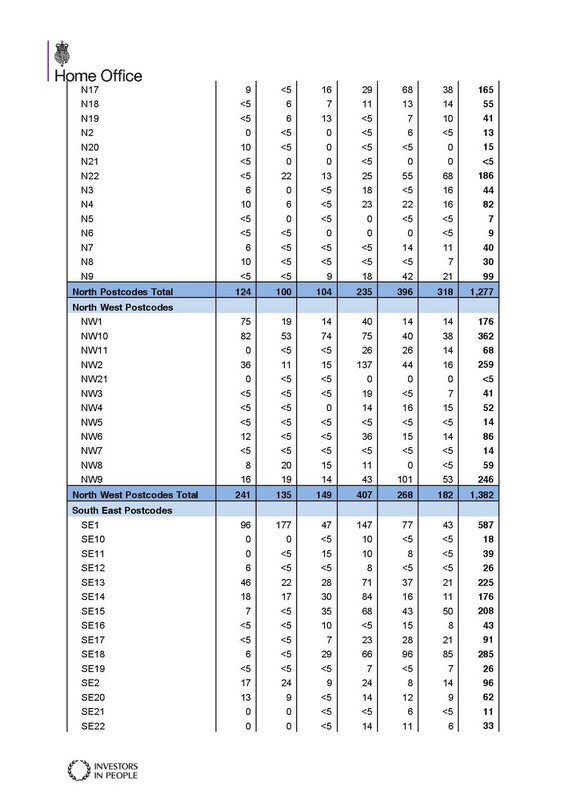 In 2015 the number dropped by around 3% to 4,573 . 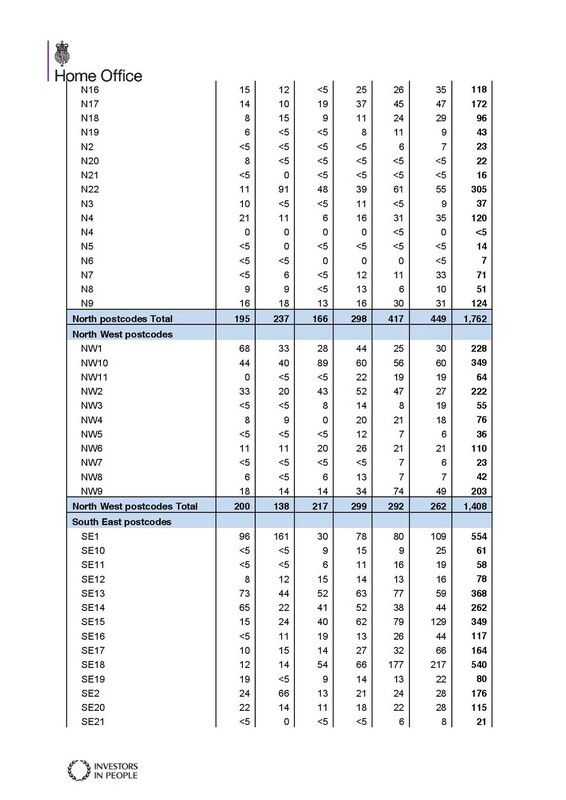 The areas of London targeted the most are E15 (1,396 raids – Stratford, West Ham, Leyton, Hackney Wick), E6 (776 raids – East Ham, Upton Park, Barking, Beckton), E7 (637 raids – Forest Gate, Stratford, Leytonstone), SE1 (554 raids – parts of Lambeth and Southwark) and SE18 (540 raids – Woolwich & Plumstead). It is notable that the number of raids dropped in a year that saw an increase in acts of resistance, from Peckham to Walworth, to Shadwell to New Cross, to the countless unreported acts of individual defiance. From five raids on East Street in the week leading up to the mass resistance of 21st June, to none at all on that street for the rest of the year and since. Direct action works. Keep up the fight! 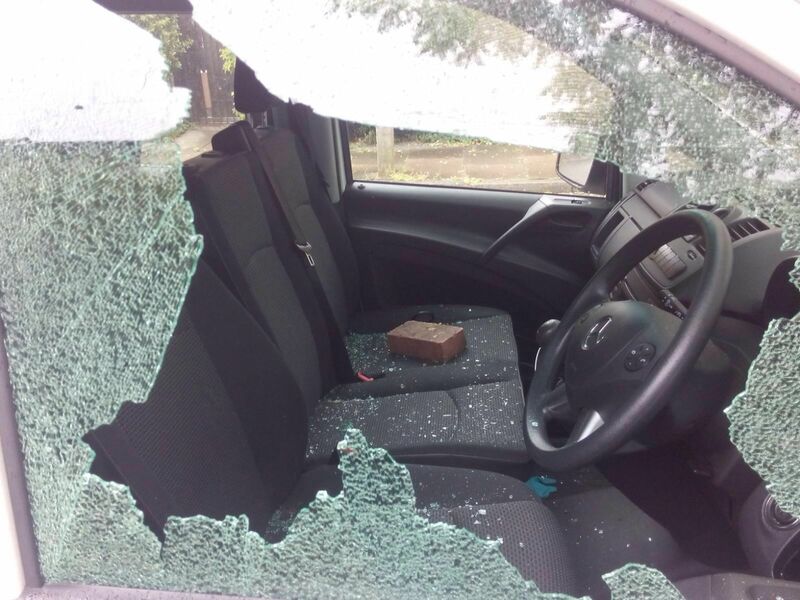 On Monday (13 June) people chased off an immigration raid targeting shopworkers on Deptford High Street, and refurbished a van left behind by Immigration Enforcement cops as they fled the scene. The next night, posters went up all along Deptford High Street to spread word of what had happened. It’s important to stay vigilant. It’s possible the resistance has warned off the raiders for a while: after last summer’s resistance on East Street market there were no more visits for at least a year. But this certainly can’t be taken for granted, they may be back any day for revenge. 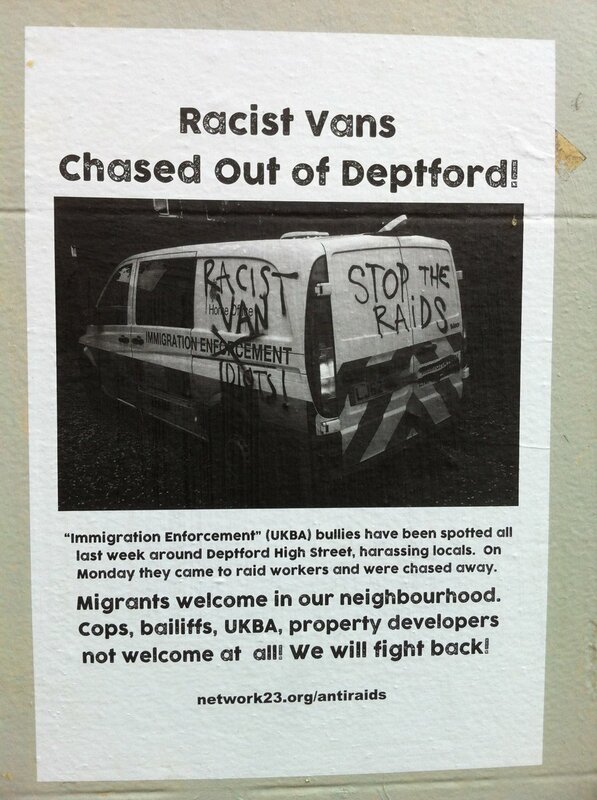 “Immigration Enforcement” (UKBA) bullies have been spotted all last week around Deptford High Street, harassing locals. On Monday they came to raid workers and were chased away. 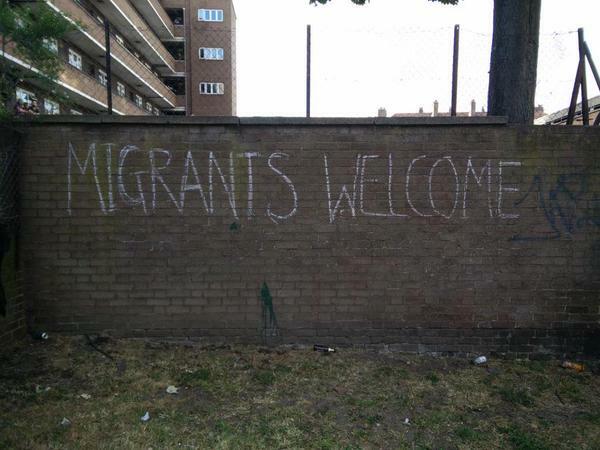 Migrants welcome in our neighbourhood. Cops, bailiffs, UKBA, property developers not welcome at all! We will fight back! 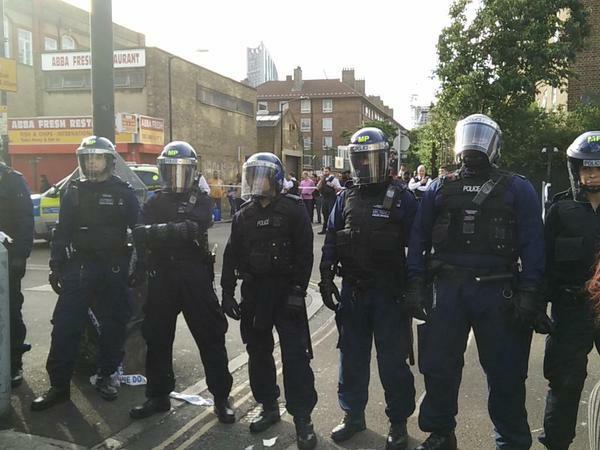 On Monday afternoon the neighbourhood of Deptford, South East London, chased away a Home Office “Immigration Enforcement” raid team. The Home Office bullyboys had reportedly been spotted several times in the previous week doing so-called “intelligence gathering”. I.e., trying to harass shopkeepers into giving them permission to carry out “operations” in their premises so they don’t have to go to the hassle of getting a court warrant. On Monday they came back in greater force, but people gathered and sent them away empty handed. 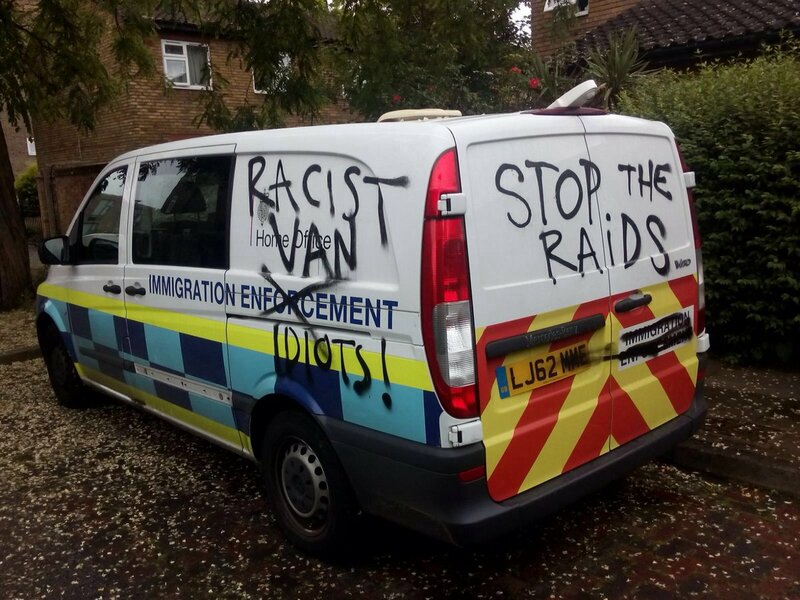 They drove off in several unmarked cars but abandoned their marked “racist van” in a back street, which was then refurbished with the windows smashed and messages written in spray paint (see pictures). 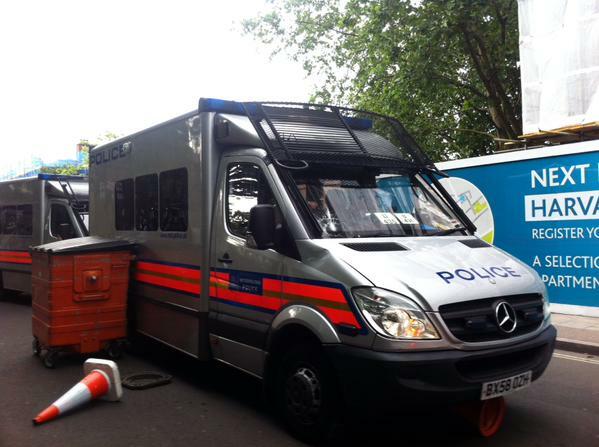 Deptford market is a regular target for Home Office raids, often working in conjunction with police, the local council and other agencies. The most recent major raid was in April. 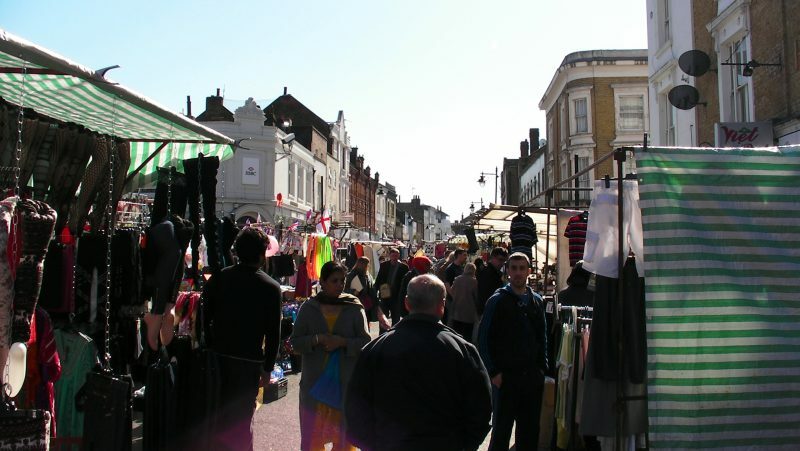 As with other London street markets (such as East Street), there are clear links between these attacks targeting migrants and wider attacks on the neighbourhood, as property developers and state authorities combine to “socially cleanse” the area, and clearing out those they consider undesirable. But resistance is growing. In Deptford, there is now a regular “Deptford Anti Raids” information stall every Saturday in the market, and Monday shows that people are ready to fight back. Check the AntiRaids twitter account for raid alerts and other live updates. The Daily Mail wrote a piece about the direct action taken by people in Shadwell last Wednesday with a usual mixture of fear-mongering and feigned indignation. Here is our response. We want to make it clear that we unequivocally support those who took action to stop an immigration raid in Shadwell on 22nd July. Immigration raids – sometimes accompanied by sensationalist TV crews – are a cynical and aggressive show of force by the Home Office, and it should come as no surprise that people are fighting back. A few damaged tyres and egged windscreens are nothing compared to the violence that takes place every day when people are snatched from their loved ones, indefinitely detained, and forcibly expelled from the country. The gutter press and politicians will always seek to isolate those who resist state repression by painting them as a threat. 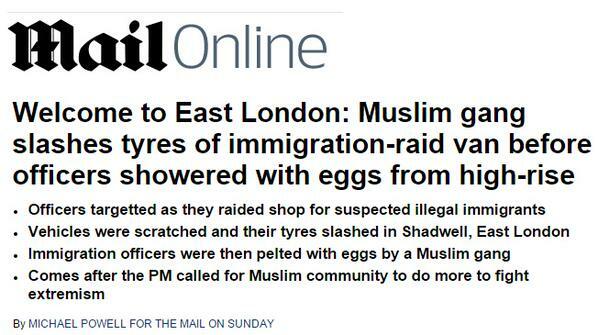 The Daily Mail’s racist headline about ‘Muslim Gangs’ is an attempt to capitalise on anti-Muslim sentiment and the reclassification of any criticism of the British state and so-called ‘British values’ as ‘extremism’. In reality, immigration raids have been challenged by people from many different backgrounds. The resistance to the raid on East Street market a few weeks ago and this most recent challenge joins many other acts of resistance, non-cooperation and solidarity that happen all the time but rarely make headlines. The reference to a ‘Muslim gang’ in the headline of yesterday’s Daily Mail article is irrelevant, spurious (see ‘What is a Gang?) and deeply racist. The only way we can counter these targeted attacks designed to intimidate and divide us is by standing side by side with those who find the courage to take action.